Holy Cross Principal Mary Conroy conquered cancer with the support of her students. 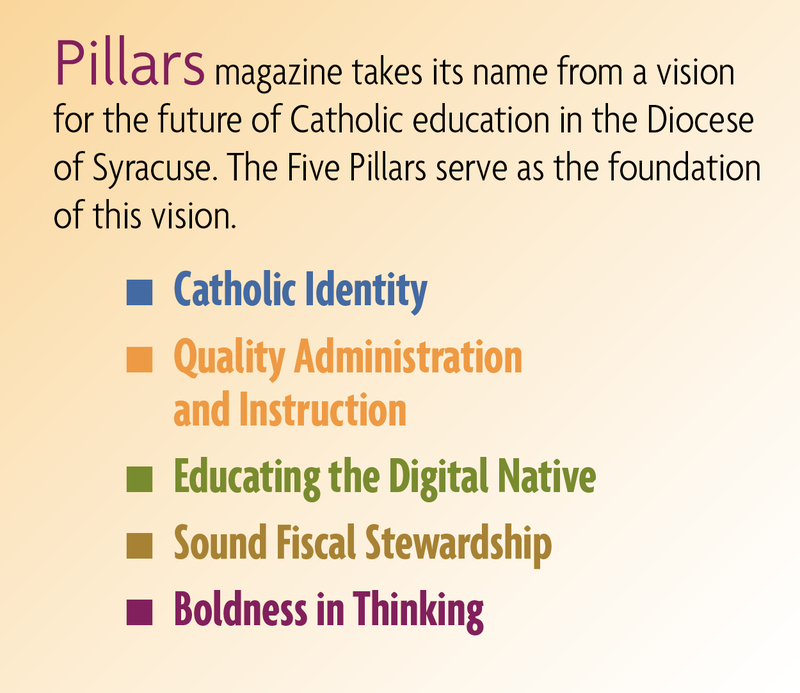 It was at the 2011 Race for the Cure fundraiser for cancer research where Mary Conroy first heard that a school in the Syracuse diocese was looking for a new principal. 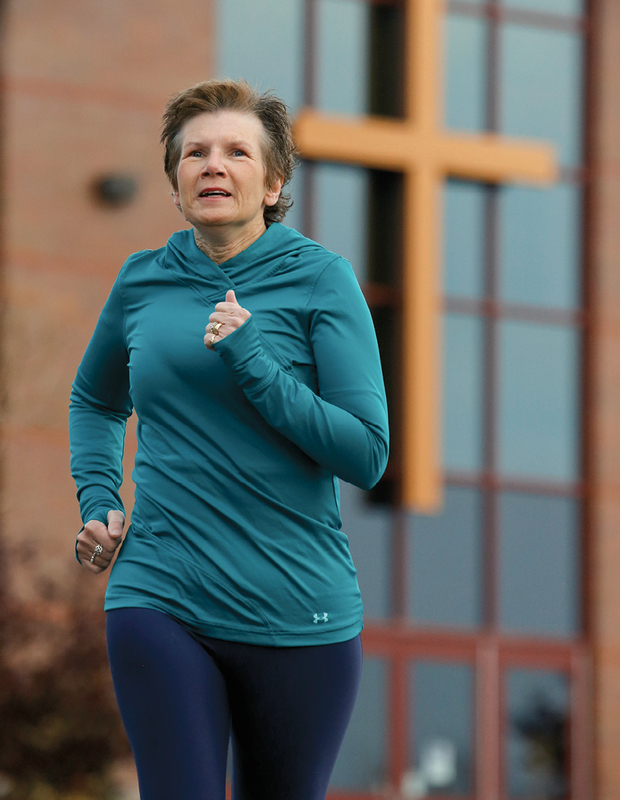 One year later, Conroy would cross the Race for the Cure finish line again, but this time alongside her students from Holy Cross School — and as a cancer survivor herself. The cancer diagnosis came on a sunny Columbus Day in October of 2011. Conroy and her husband were on the way to get the car washed. “And I thought, ‘Oh! My mammogram,’ I almost forgot about the appointment,” Conroy said. Soon she was hearing the words that no woman wants to hear: “They said there was an abnormality.” It was tiny, but it was something, and they just wanted to get it checked out. It was pretty shocking,” Conroy said. Then there was a visit to the surgeon, a biopsy, and the results showing that the abnormality was cancer. It was Stage One, and a lumpectomy was scheduled for just a few weeks later. The doctors recommended 36 radiation treatments and eight rounds of chemotherapy. “I had just started the job that summer,” Conroy said. Her doctor said she usually recommended that people who work in schools take time off during treatment, but Conroy refused. She wanted to keep going, to retain some control over her life. Somehow, she said, it worked out. The chemotherapy was every other week, and she could usually schedule the appointments in the afternoon, so she could work all morning and through both lunch periods where she spends most days with the children in the cafeteria. But Conroy knew she couldn’t keep her battle with cancer from the school community, especially when everyone had been so welcoming to her. She decided to tell everyone, from the parents and faculty members to the tiniest students. She would be honest and open and encourage the students to learn what they could from her experience. “I didn’t want the kids to be concerned. I wanted them to know that I had cancer, but the cancer was removed,” Conroy said. In fact, Conroy lost her hair around Christmas and started wearing the wig to school after the break. She was always open and honest with the students. The last day of chemotherapy came in March 2012, just before the annual St. Baldrick’s Day fundraiser in which participants collect donations to fight childhood cancer by shaving their heads. Holy Cross had always drawn together a large team of students and parents ready to shave their heads to raise thousands of dollars. Conroy’s husband was also a regular participant in the fundraiser. But this year Conroy took part, too, having her photo taken without the wig and next to her newly-shorn husband. Holy Cross students also participated in Locks of Love, which makes wigs of real hair for children with cancer. They raised money for Pennies for Patients which benefits people with lymphoma and leukimia. Beyond that, the staff, students and families of Holy Cross supported Conroy by making dinners, saying prayers, and telling her of their own battles against breast cancer. “The community itself is just all about support and community service,” Conroy said. When a survey asked her to estimate how many hours of community service the students participated in, she couldn’t even begin to put a number to the devotion she had seen. It was all around her every day. Conroy was still undergoing radiation when she took part in this year’s Race for the Cure, but the treatments were nearing their end. It was her first run since the diagnosis, and parents and students in the Holy Cross “Crusaders for the Cure” Running Club ran right alongside her. Being honest with the students was, she said, a good opportunity to show them how to cope with the challenges that come in life. “It was a great opportunity to see that everybody doesn’t die from cancer, that there can be a happy ending,” Conroy said. She has since gotten a clean bill of health from her doctors. And now that Conroy has crossed the finish line, she’s back out running most days, grateful for her own happy ending.